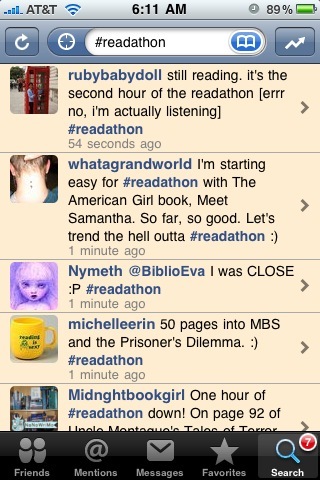 The readathon has been on the Twitter trending topics all morning from what I can see; so much fun! I think I’m spending more time refreshing my Echofon view than reading… Oops. At any rate, for this hour’s mini challenge, we’ve been asked to provide a Twitter screenshot of #readathon trending; here’s one from my iPhone app for my contribution. The image links to my Twitter page; come watch if you wanna see what’s going on with my day of reading. Whew, this took longer than I had anticipated – must get back to a book already! Good luck with all of your reading today! Thanks, Tracie! We’re trying to inform people about the readathon as the inquiries come in, and yes, there are some nasty comments, but those of us who are crazy enough about reading are used to being heckled about it ;) Glad you stopped by! Such a great morning here in South Alabama, just the perfect time to grab that cup of coffee and read, read, read!!! So keep up the great reading and enjoy!!! Of course it’s trending on twitter! Readers are a powerful group. :-) Happy reading today. We are indeed :) Thank you! Have fun reading the rest of the day! Aw man, we were doing so well for so long! I’d tweet more, but I’m feeling a bit like a slacker with only 200-ish pages down… Will try to do my part, though ;) Thanks for coming over, and enjoy your reading, as well!